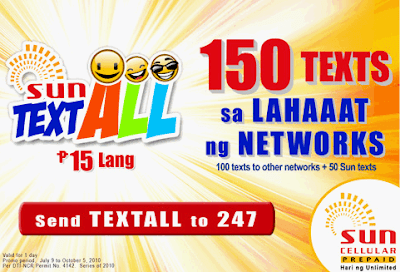 With Sun cellular's Text All 15, you can send 100 free text messages to other networks and 50 free text messages to your fellow sun subscribers ,1 whole day, for only P15. Enjoy it prepaid sun subscribers while it last (until October 5, 2010 only). Thanks symbianize for the tip. And if this is not enough for you, try out the new Sun Super Loaded 25 with free mobile internet. sun changed the text all promo to 100 text to sun then 50 to other networks. It used to be 100 text to other networks then 50 to sun. bakit nila binago ang pangit na tuloy.wala na ba iabng alternative? Non that i heard of. medyo ok pa naman yung update na ginawa nila di ba? i thought this promo says 100 texts to other network then 50 to sun to sun? bakit naging 50 to other network then 100 to sun to sun? Shown in the ads is 100 texts to other networks and 50 sun-to-sun. But in my notification, it's the other way around. Only 50 texts to other networks and 100 sun-to-sun. The company should have already changed their ads. Thanks. yeah right..tried also, ganun din nangyare...nabiktima aq, 100 sun to sun pala at 50 lang to other network!y like that sun!ur bluffing ur customers! Guys, please do mind that this post is from last year pa.
engot pala kau eh d nyo ba nkta ung validity? eto ung 30mb tama? enough ba yun?